Fabricated from high-strength steel, the perfect flat bench or utility bench provides the steadiness and support that you need for dumbbell bench presses, triceps dips, ab crunches and much more. 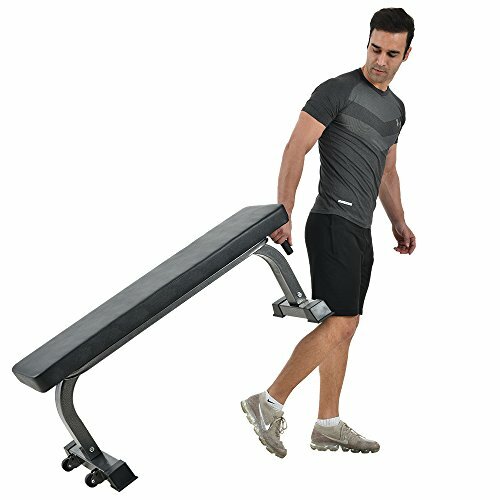 This bench comes with attached wheels and a convenient grab bar, so you can lift and roll the bench out of the way, or into storage after your workouts. You can have this do-it-all bench in your home or office, without it always taking up valuable floor space. ✔Heavy duty 4-way steel frame provides added stability and durability. No wobbling or shaking no matter how much you lift. Maximum weight capacity is 1,000LB. ✔The thickness of our steel frame is 15 gauge. Traditional benches are around 11-12 gauge. ✔The thick, dense 45x12x3 inch cushion is comfortable, yet provides the support and durability you need, workout after workout. The exterior leather stands up to whatever grueling exercise routines you put it through. ✔Bench is also perfect for stretching, regular ab routines and can even be incorporated with other barbell-based equipment to give you the workout you want from your home gym. ✔Wheels and handle are designed to help move the bench around to fit your workout goals and storage needs. Finer Form is aiming to bring the best quality exercise equipment to your home gym with the most affordable price possible. If you have any questions about our products and workouts, need replacement parts or simply chat, please do not hesitate to contact us. GYM-QUALITY FLAT BENCH - High grade steel with scratch resistant powder-coated finish to stand up to the hardest exercise routines. UNIQUE DESIGN - 4-way frame structure handles up to 1,000 lbs. and provides stable support for variety of workouts. No wobbling or shaking! HIGH-DENSITY CUSHIONING - 45x12x3 INCHES comfortable cushion pad, provides consistent comfort and supports your core for a variety of exercises. WHEELS AND HANDLE - mobile bench with wheels and a handle, simply lift and roll to relocate bench to the most convenient spaces. MULTI-PURPOSE USE - perfect for popular full-body workouts like dumbbell presses, chest presses, tricep bench dips etc. Great for use with squat rack or weights. If you have any questions about this product by Finer Form, contact us by completing and submitting the form below. If you are looking for a specif part number, please include it with your message.